The rumors were true—the neighbors weren’t eating organic. This cutting-edge ultra-modern architectural layout shows how designers can fine tune metallic tones, straight lines, and rigid edges into a layout which shines elegance and luxury. Tonality variations in the color of the metals used create a striking effect with nothing more than a few creepers and a coat of cobalt giving just the right contrast when set upon steel. Generous use of glass gives a great influx of light, granting a sense of spaciousness to each apartment, while also supplying a fantastic view of the outlying area. Dark greys, blacks and dull silvers are best accentuated by bold, strong colors. One had need just look at the red towel, warm glowing room light and basic flower arrangements used to get a great idea of how bright colors will widen your space while setting a minimalistic center of focus for any area of your home. 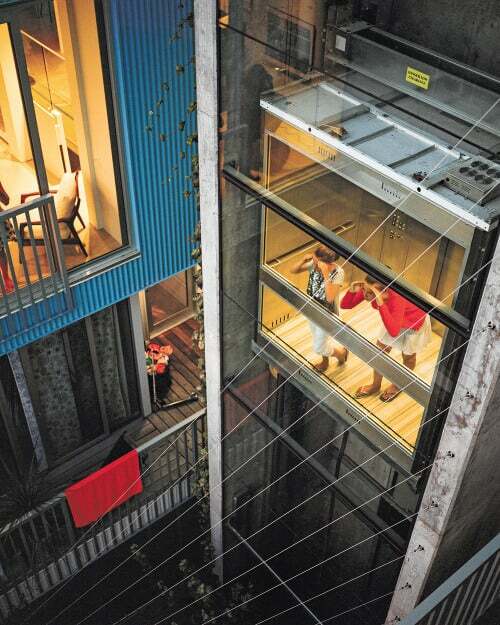 An elevator shaft hinting towards industrial applications fits perfectly in this modern apartment complex. Encased in glass, a full view of the entire complex and outlying surroundings is supplied. High railings grant security and superior style, supplying ample space for fun and games even if you are in a high-rise.